When it comes to the inks utilized in printing, there are a variety of factors to consider. While you undoubtedly want a high-quality ink that will provide a rich look, did you know that different inks also impact the planet in different ways? Here at House Of Printing, our print shop is committed to using environmentally friendly methods in our printing process, including the use of eco-friendly inks. It is one of the many things that makes us stand out from other printing companies in Burtonsville. 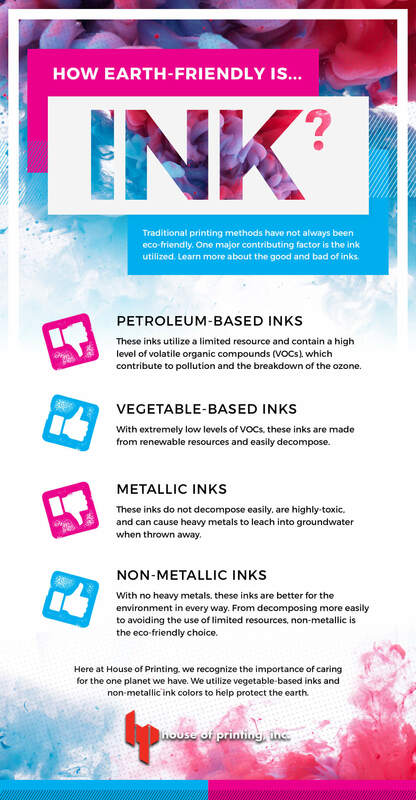 Read on to learn more about how different ink bases contribute to the environment in different ways and about what action we are taking to contribute to the healthy future of our planet. Unfortunately, many inks are harmful to our environment. While the printing process is a vital part of most business’ operations, it is critical to understand what takes place when the wrong inks are utilized. In the past, most inks were designed with petroleum as their base. Today, many print shops still utilize this harmful ink. Petroleum-based inks are problematic for multiple reasons. One reason is that they contain harmful volatile organic compounds (VOCs). While “organic” might sound like a good thing, in this case, it is not. These compounds are released into the air during the printing process and they can cause detrimental damage to our ozone layer. Not to mention the fact that breathing in air with VOCs is also harmful to humans. Another issue with petroleum-based inks is that they are created with a non-renewable resource. Overall, petroleum-based inks are bad news for our planet. Not only do we have the issue of petroleum-based inks and their toxicity to worry about, but we also have the concern of metallic inks, which contain heavy metals. Once discarded, anything printed with metallic inks can sit in landfills, without quickly decomposing. The heavy metals can then leach into the groundwaters, which is a hazard to our health and the environment as a whole. The good news is that with an increased focus on environmentally-friendly business practices, inks have been designed to spare the planet. Check out the options that guard against damage to the earth. Our print shop uses only Earthpride™ vegetable-based inks for all of our processes. These vegetable-based inks contain extremely low levels of VOCs, making them better for our team and our planet. Over time, these vegetable-based inks have been improved upon to the point that you won’t be able to see a noticeable difference between these veggie-based inks and their petroleum counterparts. While heavy metals were once needed to achieve certain fluorescent and bright ink colors, this is no longer the case. We can match any color with our non-metallic vegetable-based inks. This means no more heavy metals pouring into our water sources. When you choose to work with House of Printing, you not only will receive high-quality printing services, but you will also be left with the knowledge that you helped contribute to a healthier planet. From eco-friendly inks to wind powered technology, we implement environmentally-friendly actions into our business practices. Contact our print shop to learn more about how we’re working toward a greener future.